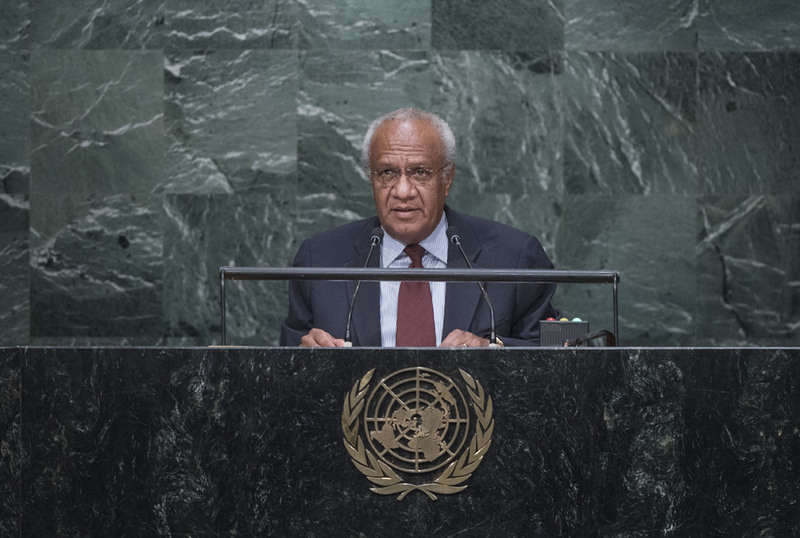 MELTEK SATO KILMAN LIVTUVANU, Prime Minister of Vanuatu, said that the impact of climate change could not be understated, and pointed to a bleak future for humanity. Despite significant achievements of the United Nations over the past seven decades, many challenges remained. The world was split into “haves” and “have nots”. In that regard, he called on developed countries to contribute to United Nations humanitarian appeals and to address the world’s growing inequality. The 2030 Agenda promised to be transformative particularly for those at the margins of society. Vanuatu welcomed the establishment of Goal 14 on the conservation and sustainable management of oceans and recognized the need for a framework within which the implementation of that Goal would be progressively assessed, benchmarked and driven forward. “For too long, we have witnessed the decline of our oceans and seas”, he stressed, reaffirming his country’s support for the proposed triennial United Nations Oceans and Seas Conference to perform the role of driving progress on that Goal. Vanuatu also welcomed the focus on gender in the 2030 Agenda. While his country had made notable progress in women’s access to basic education and health services, “I want to see more tangible progress in women and girls’ advancement and their active participation in national leadership,” he said. The recently concluded Addis Ababa Action Agenda, he continued, had dealt with issues relating to financial resources, accessing appropriate technology and improving national capacity. Calling for all developed countries to meet their official development assistance (ODA) commitments, he thanked China for its recent announcement of assistance and welcomed the least developed country initiative of establishing a technology bank in Istanbul. In the area of information and communications technology (ICT) development, his country had made great strides and had recently been presented with the United Nations ICT for Development Award. ICT would remain one of the key tools for implementing the Sustainable Development Goals in Vanuatu. He urged the United Nations to assist developing countries — especially small island developing States and least developed countries — in developing their technological capacity. However, he went on, none of that work would mean anything if a strong agreement was not reached at the Climate Conference in Paris. “Without addressing climate change, sustainable development for small island developing States cannot be achieved,” he stressed. Pacific island leaders continued to voice their concerns about the issue, calling for an agreement to keep temperatures well below 1.5°C above pre-industrial levels. They also called for Annex 1 countries to contribute significantly to their collective adaptation needs. Finally, he called on the United Nations not to lose sight of the issue of decolonization, a “long overdue” challenge that should become one of the past.